When last we left our hero, lo those many weeks ago (sorry about that) it was early afternoon in Bristol and she was full-to-brimming with the kind of satisfaction that can only be engendered by completing a highly bloggable visit to a well-presented and diverting site involving lots of Victorian engineering and gears, all before lunch time, and with the promise of more to come. After leaving ship, I continued walking along the harbour but the weather turned and what started as a light rain - the kind that those familiar with UK weather will usually not even bother opening an umbrella for - quickly became something that while not quite torrential still required shelter of some kind. Luckily, just as this was happening, I was passing by another lovely little site - the last surviving Fairburn steam-powered crane in the UK. Designed by William Fairburn and patented in 1850 - the salient feature of the Fairburn design is the elegantly curved jib that allowed it to reach further over the gunwales of increasingly large ships. The strength of the jib comes from its construction as a series of box girders. It's rarely open to the public, and in fact wasn't really open on that Saturday either. 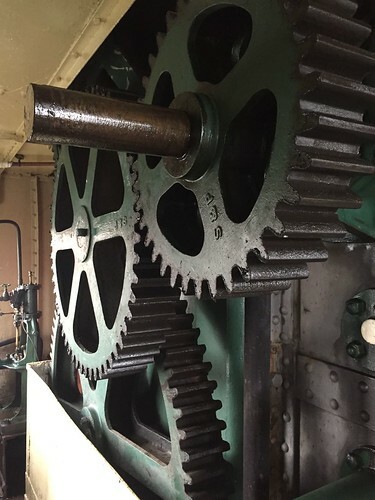 But luckily, as I was passing and the rain was pelting down, I saw the door open and was invited into the small cabin along with another damp pedestrian, by a young man who was there as a volunteer cleaning out the boiler for the next time they planned to fire it up. He proudly informed us that the crane is still safety certified to lift 35 tons. And he let me take some pictures of lovely big, greasy gears. It wasn't long, though, before the weather cleared and I left the young man to finish mucking out his crane (or whatever it is one does to prepare a steam engine for use) and ventured into central Bristol for coffee and lunch. Bristol is a university town, so it is frankly bursting with small independent restaurants and coffee shops. And in the kind of coincidence that restores one's faith in whoever or whatever one has faith in, there was also a food festival going on that weekend, so I kept stumbling into open public spaces filled with stalls selling artisanal charcuterie or fresh local produce or patisserie or ice cream or handmade donuts. Really, the whole downtown of Bristol seems quite lovely, and the sun was shining, and I thoroughly enjoyed walking around while I gradually made my way north-ish and westward towards the next big Brunel site on my list: the Clifton Suspension Bridge. The bridge was one of the things that drew me to Bristol in the first place, so I was keen to see it up close. Little did I realise what a brilliant and fantastic thing it is. 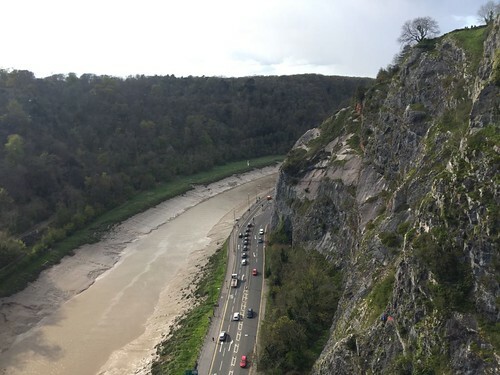 The bridge spans the Avon Gorge, a dramatic geological feature that's more than 700 feet wide and 300 feet deep at the site of the bridge. It’s the (eventual) result of a sponsored design contest to devise a bridge that could span the gorge but also allow the passage of tall-masted sailing ships below it (a problem that Astute Go Stay Work Play Live readers will recall was solved in a much different way in London). The contest elicited designs from 22 entrants, including no less than four from our man Brunel, never one to do things by half measures. Unfortunately, the contest was judged by the Scottish civil engineer Thomas Telford, who decided that none of the submitted designs were suitable, but was happy to provide one of his own that he naturally deemed ideal for the circumstance. How lucky! Luckier still, officials decided the cost of Telford's design was too great, and sought revised plans for a wrought iron suspension bridge, eventually choosing a design by Brunel (after what has to be admitted was a bit of jiggery-pokery-like strong-arming on Brunel's part). Though perhaps he can be forgiven considering the estimated cost of his design was £10,000 less than Telford's stone towers. 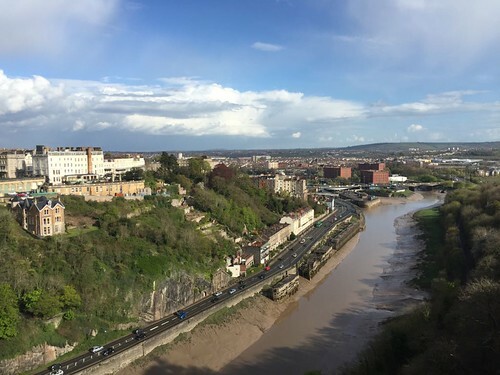 Construction started in 1831, but was halted only days later by the Bristol Riots, which left the city's commerce struggling to recover and dried up funding for the bridge. Work began again in 1836, but faltered once more and continued in an on-again-off-again fashion until it was finally opened in 1864. However, Brunel was unable to attend the opening of the completed bridge, owing to the slight inconvenience of having died 5 years previously. 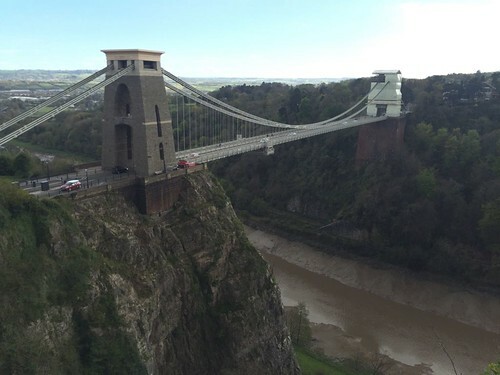 Some even assert that after the numerous revisions and compromises to the structure by other consulting engineers Brunel shouldn’t really be considered the bridge’s designer. Or at least not its sole designer. Nevertheless, it is a truly stunning structure. The rain continued in fits and starts but at this point the sun came out and this was the result. Gorgeous. Brunel's original design was a sort of faux Egyptian thing that called for the towers to be topped with sphinxes, but they were never added. Boo! I took that second photo from the rocky crags near the Clifton Observatory. The observatory looked like a very worthy site to add to my schedule because it's got a big camera obscura that shows a 360 degree image of the view from the top of the tower via a series of mirrors. And there's a tunnel from the observatory to a cave on the side of the cliff where you can look out onto the gorge. Sadly, it was closed by the time I got there. Sadder still, I never made it back the next day. But on a happy note this means I'll probably have to go back to Bristol, because in addition to the camera obscura and the tunnel/cave combo there are also 371 coffee shops I never made it to. What I did see, though, was a bizarre local landmark simply called the rock slide. Don't be fooled, though, into thinking I'm talking about a place where rocks have slid off the side of a hill. Certainly not. The rock slide is a place where people go to slide down the rocks. Of course. And that was about it for the day. Considering the precipitous height of the gorge, you can imagine that there was some fairly significant uphill trekking involved in getting there from sea-level, where I started. So having spent most of the day on my feet, I was pleased to realise that the sun was well and truly over the yardarm and quickly found a convivial pub where I had a well deserved gin and tonic (artisinally served with a sprig of rosemary, of course) and rested my feet before having supper and a passable sticky toffee pudding. And then just to top things off I walked all the way back to the house, by which time my feet had just enough left in them to get me upstairs to bed. It's not the top tourist destination in the UK. Not by a long chalk, and not with the over-hyped and over-crowded Bath Spa just down the road. But I was looking for an easy place to spend the May Bank Holiday weekend - somewhere cheap and quick to get to, big enough to be diverting for a few days, and unlikely to be overrun by Bank Holiday tourism. Having realised that many of the trains I've been getting on to take me to my current far-flung-ish mooring locations have had, as their terminus, Bristol Temple Meads station, I thought it was worth checking out. And when I discovered that the city is home to a quite famous suspension bridge (A cool bridge! Wahoo!) AND to the first ever iron-sided, screw-propellor-driven passenger ship (designed by Brunel! Wahoo!) AND also the home to a highly rated walking tour of street art, including a bunch of Banksy (Banksy! Wahoo!) it wasn't long before I was booking a train ticket and making plans. I know it's been a long time since the last blog. I can only put it down to a potent combination of work and life distractions, coupled with an utter lack of inspiration. Never mind all that though, because Bristol was positively packed with blogworthy stuff. So much so that I think I'll need to tackle it in two instalments. So let's start where I started. Jude and her housemate Rosemary were friendly and welcoming right from the beginning. Really, it was more like being at the Bristol branch of the Friendly House in Brixton. The room was clean and bright and had all I needed. And the first thing they did was invite me for a cup of coffee. Five minutes after arriving I was sitting in the the kitchen and chatting away as if with old friends (but - crucially - old friends who hadn't already heard all my stories...) And they set me up with a good local map, and directions, and even had a free ticket to see the S.S Great Britain, which was going to be my first stop. And it was sunny out. So far, Bristol was scoring very very high indeed. A bit of background now, since a lot of this weekend is going to be about sites related to one remarkable man - Isambard Kingdom Brunel. First of all: awesome name (Also, Isambard is pronounced IZ-em-bard. Not EYES-em-bard). Second: Astute Go Stay Work Play readers will recall Brunel as the younger of the father and son team responsible for the Thames Tunnel. 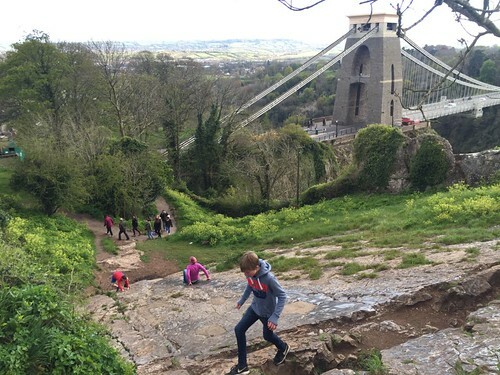 In fact, Brunel the younger is widely regarded as "The most famous engineer in history." And a new biography I bought claims "Brunel's originality was matched by his breadth of mind: excelling as architect, surveyor, civil engineer, mechanical engineer and ship designer." In 2002 he came second in the "100 Greatest Britons" poll, losing out only to Sir Winston Churchill and besting, among others, William Shakespeare, Charles Darwin, Isaac Newton and John Lennon. Heady company indeed, but, as we shall see, every accolade is well-deserved. 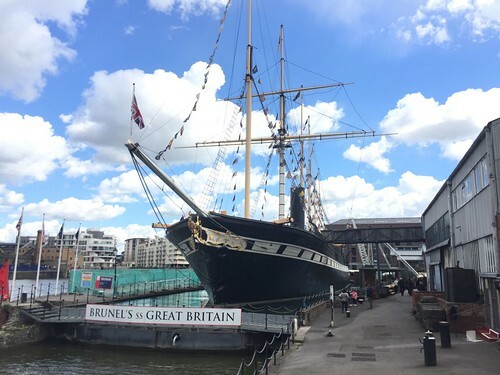 When I started writing this post I had no idea how much of Brunel's work I'd already taken advantage of just in getting me to Bristol to begin with. To start with, Isambard Kingdom Brunel was the chief engineer and driving force of the Great Western Railway running from... you guessed it: London to Bristol. The train I boarded on Saturday morning originated at Paddington station, which was designed by Brunel. Every mile of the tracks it ran on were surveyed by him, passing over viaducts and through tunnels he designed, and ending at Bristol Temple Meads Station, also a Brunel creation. 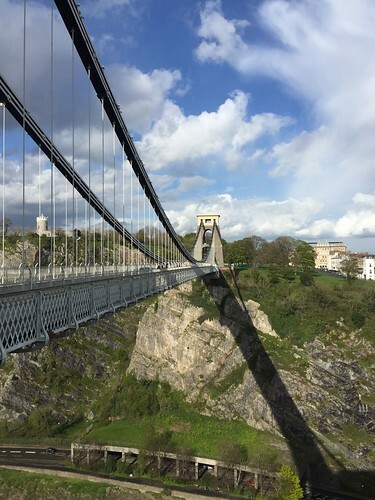 At which point I got off the train and went to visit a ground-breaking trans-Atlantic passenger liner he also designed and then finished the day at a spectacular suspension bridge also designed by Isambard Kingdon Brunel. Tunnels, bridges, railways, building, ships… the man was a legend. Brunel's S.S. Great Britain. Err, obviously. 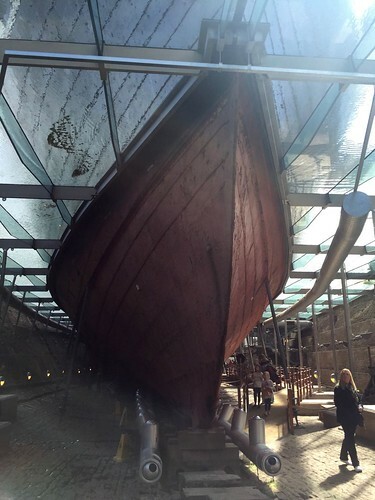 The S.S. Great Britain was not the first ship designed by Brunel. The first was the P.S. Great Western - a wooden-hulled paddle steamer. The Great Britain was intended to be another wooden paddle steamer, but this is where it gets interesting. By the time the ship was commissioned around 1839 Brunel’s reputation allowed him greater control over the design, into which Brunel incorporated two major innovations, which we’ll get to later. 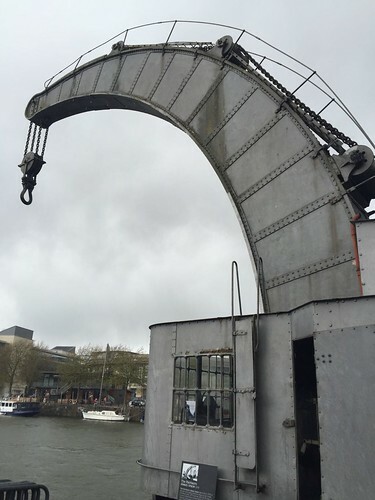 The ship itself is now the star attraction of Bristol’s harbour, an extensive network of natural and man-made channels, locks and islands all dating from Bristol’s days as England’s second city and hub for maritime trade and travel. The S.S. Great Britain is held in dry dock there - the same dry dock in which is was built - and is restored and open to the public inside and out. There’s also an accompanying museum (and gift shop, natch) and the whole site is done up really well. When you get to the ship you’re first directed into the dry dock itself, which is very cleverly presented. The ship is held in place by big metal braces, and at the level on the hull that would match the waterline, a transparent glass roof is installed all the way around the boat, leaving the area underneath protected from the elements and allowing visitors to walk all the way around the ship. And to add to the effect, the roof is covered with a shallow layer of water that gives the illusion the ship is floating, and makes lovely dappled reflections below while also insulating the space below, resulting in 10-20% lower energy costs. Not-great photo of the ship in the dry dock. You get the idea. But keeping rain off precious tourists’ heads is not the main reason for the glass roof. That’s related to the first of those innovations I mentioned earlier. 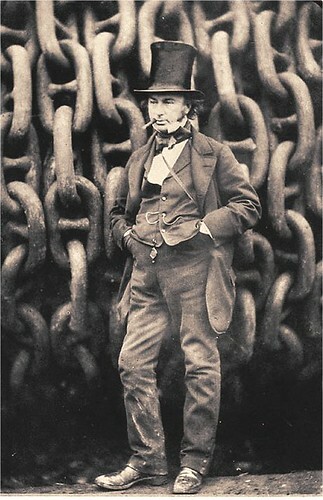 Rather than building the hull of the ship with wood, as was traditional, Brunel decided to switch from wood to iron. This may seem counter-intuitive, since we tend to think of iron as A Very Heavy Thing, but due to it’s massive structural strength an iron-hulled ship is actually lighter than a wooden one. Iron hulls can also be built much longer and bigger, because they’re more resistant to the flexing forces of the waves under the hull. (Which is, interestingly, called “hogging”. Or am I the only one who finds that interesting?) Anyway, switching to iron allowed Brunel to make the ship much larger. In fact, it was the longest passenger ship in the world from 1845 to 1854. However, after 150 years, the iron in the hull is in rough shape. Having the lower hull protected protected from rain helps stop the rust. 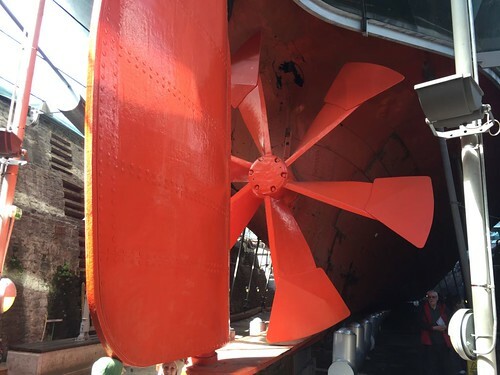 What helps even more is a massive system of heaters that lower the humidity of the surrounding air to 20%, virtually stopping all corrosion and making it perhaps the dryest dry dock in the world. Not happy metal. Above the water line, the iron hull has been scraped and painted to protect it and make it pretty and shiny. Brunel’s second big innovation was to scrap the paddle wheel and add a screw propellor. Paddle wheels had long been the favoured technology for steam driven ships, but having seen a wooden-hulled ship with a propellor, Brunel was convinced of the advantages and pressed for this new design. In brief, propellors are cheaper and more efficient, and give the ship greater stability and manoeuvrability. (Sadly, though, they greatly lessen the chances of attracting interesting characters like riverboat gamblers and spiritual-singing stereotypes.) Thus, the Great Britain became the first propellor-driven, iron hulled steamer to cross the Atlantic. The six-bladed propellor. Oh, and Brunel tinkered with the rudder too, adjusting the position where the tiller control was attached to make it much easier to steer. After seeing the dry dock visitors are directed to a nice museum with some interesting displays that takes one only slightly too long to get through before you’re allowed up on the deck of the boat itself, and then down through the whole ship. Again, it’s all presented really well. 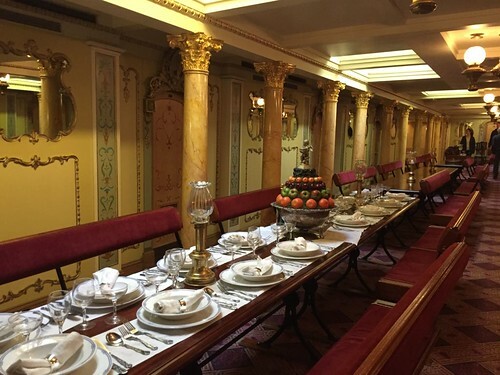 You can poke your head into the first class cabins and dining hall, walk through the galleys and engine rooms (where the engines are actually moving!) 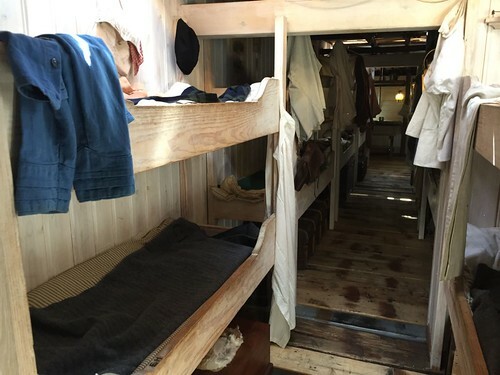 and then see how the “other half” travelled in the lower class compartments and bunks. You can even visit the hold of the ship where the cargo was stored. Check out the benches at the tables. They’re stuck to the floor, but the backrest is double-sided and swings back and forth so you can face the table or flip it the other way and face the room. I can’t figure out who invented that system, but it’s devilishly clever and has Brunel written all over it. These bunks are super skinny. About 18” wide. Interestingly, the First Class ones are the same width, and also double-stacked. They're just in bigger, nicer cabins, with fancier bed linen. 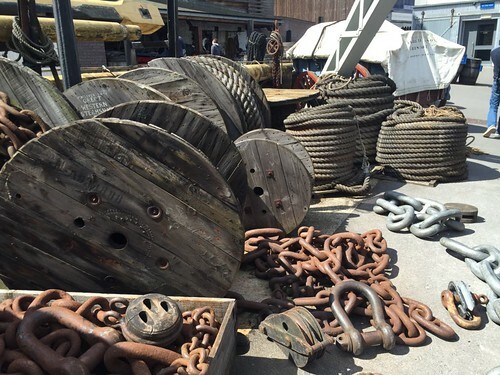 The story of the ship’s life is fascinating. It started out as a posh passenger liner crossing the Atlantic, then spent years delivering immigrants to Australia. In 1882 it was converted to a sail-driven vessel and used for the transport of coal and other cargo but a fire on board damaged the ship beyond repair on a journey to the Falkland Islands in 1886 and it then became a floating coal bunker used for storage in the Port Stanley harbour. The ships’s fortunes continued to fall until it was eventually towed to Sparrow Cove and unceremoniously scuttled in 1937. And there the story might have ended, except that in 1969, naval architect Ewan Corlett, recognising it as a unique naval artifact, organised a campaign to save it from deteriorating beyond rescue in the waters of Sparrow Cove. 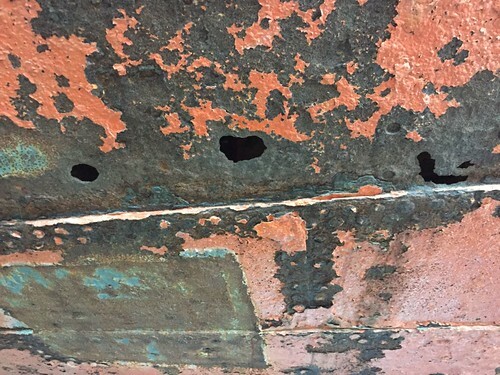 Corlett surveyed the ship and decided that despite years of decay and abuse - including having holes drilled through the hull to scuttle it, bits chopped out of it to repair a British warship during WWII, and a rather alarming and massive tear in the side - it could be saved. They chartered a submersible pontoon and successfully re-floated the boat, while divers patched the ruptured hull with timber and old mattresses donated by local Falkland Islanders. (Really. Donated mattresses.) They then slowly made their way back across the Atlantic and two months later the ship returned to the dry dock in Bristol where it was built and restoration work began. The museum goes into a lot of detail about the rescue, and it’s actually quite touching, showing old film of crowds gathered on bridges and waterside watching and cheering as this ship returned home. I thought the while thing was absolutely excellent. 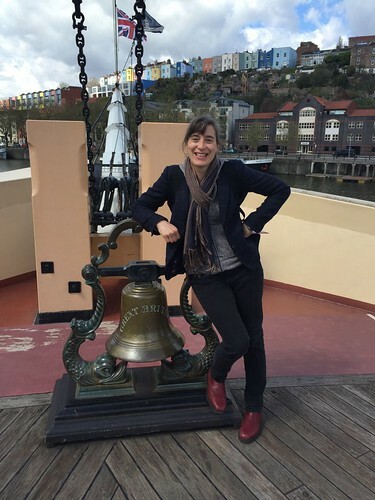 The story of the ship, the connection with Brunel and the engineering brilliance behind it (and yes, Karen, there were GEARS! ), the restoration, the surrounding museum and shipyard… it was all top notch. And better yet, but the time I’d had my fill of the boat it was only about one o’clock in the afternoon, which left me most of the day to explore more of Bristol’s attractions. You however, will have to wait to hear about those because this post is long enough, and my out-of-shape blogging muscles need a break. Stay tuned and I'll try to get the next post out before July.